Discussion in 'SSDs & Data Storage' started by daphatgrant, Aug 12, 2018. Hey [H], I'm not sure if this belongs here or in the operating systems subforum so if it needs to be moved go ahead. 1. I have a file server that's got an old OS drive in it (160gb blue) that I'd like to replace. I bought a 250gb Samsung 960 evo to replace the current drive but wanted to check about how my storage pools will be affected before hand. I believe that the pooling info is kept on the pool drives and not the main OS drive? So I'd just need to reacquire the pool after a new OS drive and windows is installed? 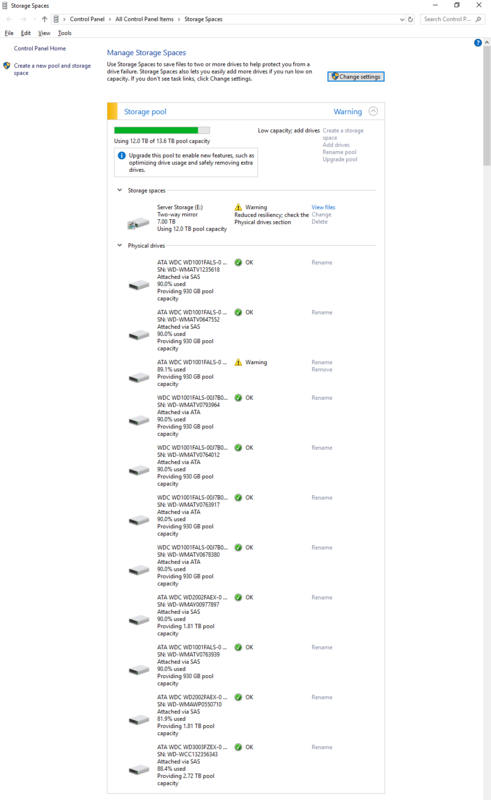 I am running windows 10 with file duplication. Is this the case? Do I need to do anything other than install the new HDD and windows? 2. There must be some HDD jealousy as a pool drive started dying the day I got the new OS drive, I'm currently running (8) 1TB Blacks, (2) 2TB blacks and (1) 3TB black. Should I grab a WD Red or Gold to replace the Black drive? I think I'll probably grab a 6TB drive to give myself some more room. Yes, the configuration is stored on the pool itself, as I see you've learned from another forum already! I'm fond of the Best Buy WD easystore drives as they often have Reds inside of them (and now, also Whites) which make for solid choices but there have been decent Toshiba HDDs on sale lately.